I once mortified my mother by asking our brand new minister if he wanted to play cards when he joined us for Sunday dinner. Unbeknownst to me - playing cards was frowned on by some church denominations. I had been learning how to play crazy eights and thought it was a great way to spend 15 minutes. I thought I was being hospitable. Dad quickly asked him if he’d like some iced tea (sweet of course) and we moved on to mom’s fried chicken in record time. Hospitality is a learned skill and the rules of host and guest differ greatly by region. In Japan you eat all the rice in your bowl and you don’t empty your glass. You decline an offer three times before you can accept. In England the host automatically offers (hot) tea which is understood to include some sort of sweet – even though the sweet is never mentioned. 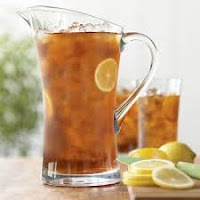 Here in the south you offer iced tea, water, coffee… pretty much any and ALL the liquids available in your home to your guests. Since 1998 Cabarrus County hosts students who come here with the Collegiate Challenge program. Collegiate Challenge is a Habitat for Humanity program for students who choose to spend their spring break week building a Habitat home. These young adults bear the costs of travel, lodging, and meals to give of their time and talents to help an unknown family get one week closer to home ownership. Four groups of students will participate in Collegiate Challenge this year: Waynesburg University-PA, Stockton University-NJ, Northwestern University-IL, and Gates County High School-NC. Cabarrus County is a good host and we put our own spin on Collegiate Challenge. We collaborate as a community to provide southern hospitality to our guests from afar. Guests are honored beings who get to use the special soaps and towels or in OUR case – get to sleep in area churches. 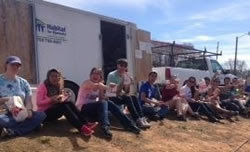 Forest Hills UMC, St. James Lutheran, First Presbyterian Concord, and Connect Christian Churches host a team for a week and provide these young volunteers with free spaces to sleep. Additional support comes from churches like McGill Baptist, Mr. Herman Lutheran, and Central UMC and area businesses like Chick-fil-A to provide meals for the hard-working students. Cannon Memorial YMCA graciously opens their locker rooms each afternoon to provide shower facilities. In addition, one of our weekday warriors takes each team out for a night of roller skating and fellowship. Thank you Cabarrus County for opening doors to the traveler and for practicing hospitality so well! If you are interested in providing meals or snacks to our Collegiate Challenge teams please contact Dyana Bostian. It’s still February but the days are getting longer and the skies already seem bluer. The groundhog’s shadow notwithstanding, it feels like the transition to the next season is underway. Spring is a magical time that lifts moods and raises spirits. 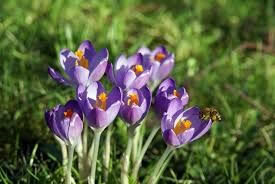 My mother rejoices every year when the crocuses bloom because she knows Spring is on its way. My touchstone is daffodils. When I start spotting the cheerful yellow blooms that tell me Spring has arrived - my heart nearly sings. What is the sign of the season that lifts your eyes skyward, makes your heart giddy, and urges your legs to run with the joy and abandon of youth? Each March a migration of youthful abandon sends students to Florida and other sunny climes for a week of NOT STUDYING called Spring Break. Many students spend a week enjoying cruises, beach sprees, and ski trips. They return to school with sunburned noses and fabulous tales of hijinks and romance. But a beautiful subset of students pursues a different type of Spring Break. 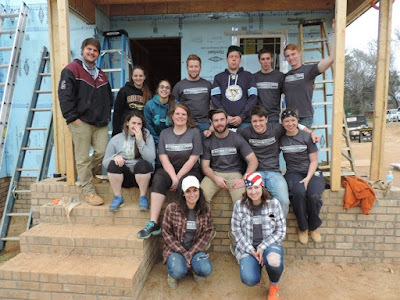 These students will travel from distant points like New Jersey and Illinois to Cabarrus County to spend a week building homes with Habitat for Humanity through a program called Collegiate Challenge. Why would these students choose to spend their Spring Break this way? Because… Well because they are still fresh and new and can still see the promise in the world. They’ve not become jaded or blasé about their blessings. They want to give back. They want to serve. Last year one of our Collegiate Challenge schools - Illinois Institute of Technology - created a gorgeous banner comprised of handwritten notes that told why they chose to pursue an alternative Spring Break and here’s a sample of what they wrote. It’s enough to make your heart ache with the beauty of the sentiments. And for a moment you remember your younger self and your own idealism. This year four groups of students will sleep in Concord churches instead of beach hotels. They will chug water on construction sites rather than pursuing Dionysus’ delights. These students will return to school (Waynesburg University - PA, Stockton University - NJ, Northwestern University – IL, and Gates County High School – NC) with blistered hands and light-filled souls from giving their time and talents to help a family get closer to homeownership. We appreciate these students more than words can say. The tasks they perform while on Habitat construction sites are vital to building a home. But the light and joy they bring through simply being themselves adds another essential element that improves the lives all who recognize the beauty inherent in joyful abandon. If you would like to help with Collegiate Challenge by providing lunch, dinner, snacks or water for the groups please contact Dyana Bostian. When I was a kid someone once referred to Nov 11th as Armistice Day. 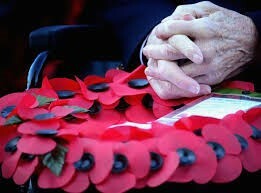 They continued by saying that on the 11th day of the 11th month at the 11th hour - the War to End All Wars ended. I have NO idea who said this to me. But for whatever reason it stuck. And even though we Americans call Nov. 11 Veterans Day, I always think of the Armistice as well. The British celebrate Nov. 11 too and red poppies are associated with their day of remembrance. The point being that individuals and groups have memories of events and people that may last longer than the original event or person. Presidents' Day is another one of those days that started out as one thing and evolved into something different. Feb 22 is President Washington’s birthday and Feb 12 is President Lincoln’s. For many years the country celebrated their birthdays unofficially and separately. The Uniform Monday Holiday Act took effect in 1971 and shifted the holiday to the third Monday of February. Marketers quickly recognized that they could play up the three-day weekend and coined the phrase “Presidents' Day”. By the 1980’s the Presidents' Day holiday had become part of the accepted vernacular. We revere our leaders – especially our presidents. My father took my siblings to Freedom Park when then president Gerald Ford came to Charlotte. I watched Saturday Night Live the night president Bill Clinton played sax on air. My nephew who lives in D.C. still tries to catch a glimpse of the president when the motorcade passes. Love or hate the individual in office – the President of the United States is a special role. 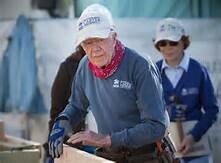 Habitat for Humanity proudly claims President Jimmy Carter and his wife Rosalynn Carter as our most visible volunteers. The Carters became involved with Habitat in 1984 when the former president led a work group in New York City and helped 19 families in need of decent, affordable shelter by joining a renovation project of a six-story building. 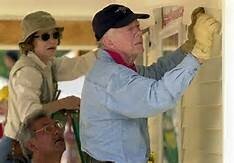 Their experience led to the Carter Work Project, an internationally-recognized event, where former President Carter and his wife give a week of their time to help improve and build Habitat homes. If you will be in Memphis, TN this August you just might see President and Mrs. Carter rubbing elbows with other volunteers in an Uptown neighborhood helping to build a home. As part of this 33rd Carter Work Project volunteers will carry out multiple tasks during the week including: beautification projects, new home construction, repairs, painting, landscaping and Aging in Place projects. The Carters have worked alongside 92,000 volunteers in 14 countries to build, renovate, and repair 3,943 Habitat for Humanity homes. President Carter and his wife generously lend their visibility to bring awareness of the critical need for affordable housing. No one living actually knew George Washington – but we all know he cannot, could not, tell a lie. His name and legacy of honor remain very much alive in the group consciousness of our nation more than 200 years after his passing. 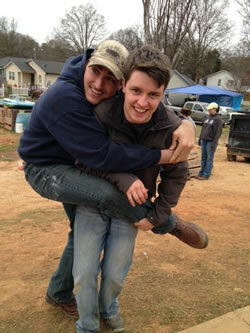 Each Habitat for Humanity home is a legacy of love that provides tangible security for the families who live in them. This Presidents' Day we pause to thank President Carter and Rosalynn, (married 69 years) for their efforts to end substandard housing and to build strong communities. We thank our supporters who have assisted Habitat Cabarrus to build 142 houses and to serve more than 800 people (including 400 children) right here. And we remind you – if you’re looking for a way to make a difference - we have multiple avenues such as donating, volunteering, and attending our events for you to help build a legacy.